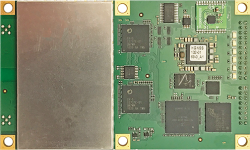 Hemisphere GPS has announced its Crescent Vector II OEM board and a series of related Crescent Vector II GPS compass products. 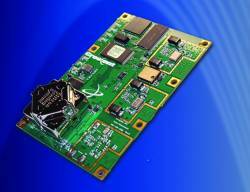 The new OEM board, targeted for system integrators, brings a series of new features to the company’s patented Crescent receiver technology, including heave, pitch, and roll output; more accurate timing, lower phase noise, and an improved accelerometer. The Crescent Vector II design provides precise heading and positioning accuracy even while a mobile platform is motionless. • V101 and V111 all-in-one GPS compass (superseding the V100/V110), a heading and positioning 50-centimeter baseline smart antenna that combines the Crescent Vector II and two multipath-resistant antennas for precise guidance, portability, and ease of installation. • VS101 and VS111 GPS compass (superseding the VS100/VS110), a receiver with user interface display and two separately-mounted antennas, uses the Crescent Vector II to deliver reliable accuracy affordably and targets machine control and navigation applications. • LV101 OEM board (superseding and backwards compatible to the LV100), integrates the Crescent Vector II, two GPS antennas, an NMEA 2000 communication processor, single-axis gyro, tilt sensor, and power supply onto a single board and provides precise heading and sub-meter position accuracy, according to the company. The Crescent Vector II OEM board and all Crescent Vector II products will be available beginning in July through the Hemisphere GPS Precision Products global dealer network. On June 24, Hemisphere GPS marked its 20th year of operations as a global player in the design and manufacture of GPS-based technology. Originally founded in 1990 as Canadian Systems International Inc., the company acquired a several companies in the precision GPS products industry, including Satloc Inc. in Scottsdale, Arizona; Outback Guidance in Hiawatha, Kansas; Del Norte Technologies in Euless, Texas and BEELINE Technologies in Brisbane, Australia. Hemisphere GPS has 230 employees, more than 500 distributors, and sales in more than 35 countries. The company is divided into three sales and marketing groups: Agriculture, Precision, and Earthworks and currently has five primary locations worldwide: Calgary, Alberta, and Winnipeg, Manitoba, Canada; Scottsdale, Arizona, and Hiawatha, Kansas, USA; and Brisbane, Australia.